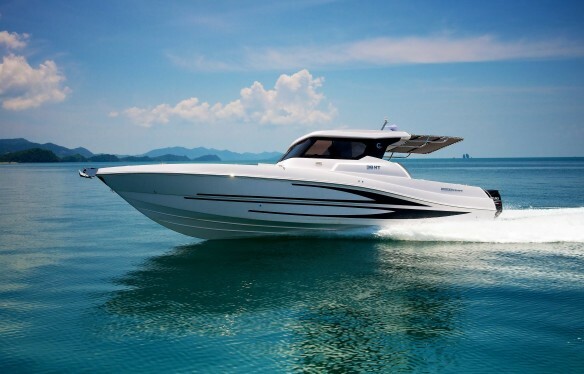 Currently the best selling boat in the Silvercraft range. This is due to her flexibility to adapt into a multi purpose platform, from a day cruiser with plenty of deck space either shaded or in the sun. A diving platform with plenty of space and storage for tanks and gear. A fishing platform again with plenty of deck space for trolling or hand lining and the all important below deck fish box’s. And a perfect all weather cruiser, as if you get caught in the rain just simply close the centre walk-through door and all passengers and crew stay dry and warm. The 36 HT is very popular with hotels and tour operators, as again she offers so much flexibility, and a smooth ride for the guests on board thanks to her excellent hull design and ride quality. Available as a basic boat or spec her up to become a real quality high end cruiser. Call or mail us for more details.